To understand how galaxies have formed, astronomers need your help to classify them according to their shapes. If you're quick, you may even be the first person to see the galaxies you're asked to classify. 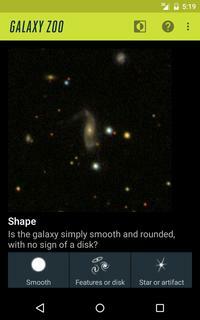 Images come from telescopes including Hubble and the Sloan Digital Sky Survey. This app caches several subjects locally so you can classify even while offline and have the classifications automatically uploaded later. 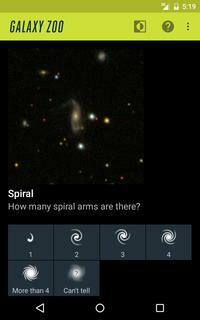 *** The sequence of questions is determined by the Galaxy Zoo project and is consistent with the web UI.